Finally, Office of the Deputy Under Secretary of Defense (Installations and Environment) finally released the DOD’s Annual Energy Management Report for Fiscal Year 2010. This report focuses on energy used by military installations and non-tactical vehicles. For ease of discussion, this report refers to both as “facilities energy.” In a footnote you will find out that this report does not address operational energy. This is the first shock you will get on the first page. What does the report say About DoD Energy Consumption? “DoD accounts for approximately 80 percent of all Federal energy consumption and spent about $15.2 billion on energy in FY2010. Seventy four percent of total DoD consumption can be attributed to operations while the remaining 26 percent was consumed by the Department’s facilities (Figure 1.1). Operational energy is used for military deployments, direct support of military deployments, and training in support of readiness for military deployment. Facilities energy comprises all other energy used at DoD’s permanent installations and by its non-tactical vehicles. Well over 90 percent of total energy is used by the Military Departments, with about 6 percent used by other DoD Agencies. 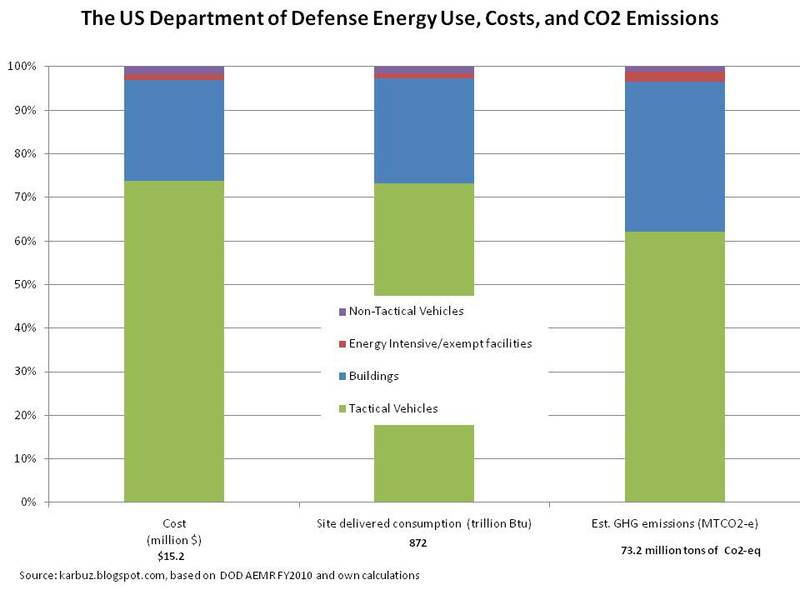 In FY2010, DoD spent $4.01 billion on facilities energy, with $0.25 billion used for fuel for 160,000 non-tactical vehicles. About $3.76 billion was spent on energy for the Department’s 507 permanent installations, which comprise more than 300,000 buildings and 200,000 other structures. These installations occupy approximately 28 million acres of land in the United States and overseas and include over 2.2 billion square feet of facilities space. But you will have a lot of details about facilities energy use. “Reducing facilities energy demand, enhancing energy security, facilitating innovative energy research and development, and increasing the use of renewable energy sources are important priorities for the Department of Defense,“ says the report. A bit exaggerated claim if you have an idea about the full picture of DOD wide energy use, costs and CO2 emissions. EISA 2007 requires Federal agencies to achieve a 20 percent reduction in non-tactical vehicle (NTV) petroleum consumption by FY2015 compared to a FY2005 baseline. E.O. 13514 extends the reduction goal to 30 percent by FY2020. In FY2010, DoD NTVs consumed the equivalent of 80.3 million gallons of Gallon of Gasoline Equivalent (GGE), which includes gasoline, diesel, and the diesel portion of biodiesel blends (80% of a B20 blend). The mix of petroleum fuel types has remained relatively stable over the past three years. While DoD generated 9,950 BBTUs eligible for the 10 U.S.C. § 2911(e) calculation, approximately 5,800 BBTUs (bottom right of Table 3.1) was from on-site generation. The other 4,150 BBTUs are the sum of renewable energy and REC purchases. If DoD is to reach the estimated 17,000 BBTUs of renewable energy to meet the 10 U.S.C. § 2911(e) goal with on-site production alone (keeping RECs and off-site purchases steady) on-site renewable production must increase by about 7,000 BBTUs. This is equivalent to approximately 1,200 MW of solar, which would cover 9,400 acres (or 67 Nellis AFB solar fields). Alternatively, 7,000 BBTUs could be met with 260 MW of new geothermal generation (equivalent to two China Lake projects). The report gives really a lot of details, by DOD services, by project etc. On the cover page it states that “Preparation of this study/report cost the Department of Defense a total of approximately $633,321 for the 2011 Fiscal Year.” This is a huge sum of money in which you cannot see an overall picture of how much energy the DOD used by energy source and how much CO2 emissions it released by consuming that energy. And of cost, you cannot see cost details. However, in Appendix B, you will find some data, less detailed than in previous years’ reports. But in those tables you will not see anymore, consumption in original units, corresponding estimated source BTU, and yes, also estimated CO2 emissions. Why is that? CO2 emissions are not important any more? Why sometimes totals do not add up? Will the DOD come up with a similar report on Operational energy? If not, what is the use of that report? Why the DOD insists on keeping fragmented energy management. However, I did my homework, below is the figure I produce by using the data provided in AEMR and my own estimations, particularly on CO2 emissions. Enjoy. Energy consumption is a methods typically begin with metering the routine gas or electricity consumption of an office or industry workplace, analysing the use of power and estimating how many reductions in power use and waste can be made. correct. For this one needs to look at the percentage of buildings where energy is metered: Electric 95%, natural gas 88%, purchased steam 69%.